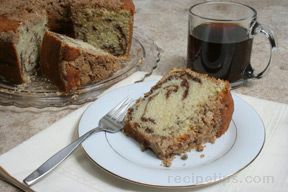 This moist coffee cake is full of flavor. 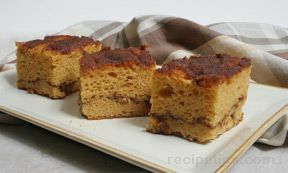 It has a streusel top and its filling provides a cinnamon flavor with a touch of chocolate. This recipe takes a little extra time but it is well work the end results. 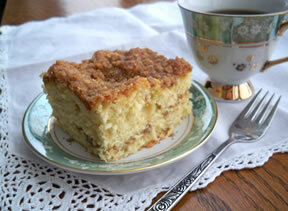 For a simpler coffee cake, see this Streusel Coffee Cake recipe. Prepare a Bundt cake pan or Angel Food cake pan by buttering the bottom and sides thoroughly. Toast 1 1/4 cups of pecans and set aside to be used later. Coarsely chop 1/4 cup of toasted pecans. In a small saucepan, heat the butter until just melted and then remove from the heat. Allow it to cool until it is just lukewarm. While the butter is cooling, combine the flour, pecans, sugar, brown sugar, cinnamon, baking powder, and salt in a small bowl. Stir the ingredients to combine evenly. Add these ingredients to the lukewarm butter and stir with a fork until they are evenly mixed. Mixture will be crumbly. Set the topping aside. Finely chop 1 cup of toasted pecans. Add the remaining filling ingredients in with the chopped pecans. Whisk these ingredients to evenly distribute. Set the filling aside. In a medium bowl, combine the flour, baking powder, baking soda, and salt. Set these ingredients aside. Using an electric mixer, cream the butter until it is light and creamy. Add about one third of the sugar to the creamed butter and beat thoroughly. Add the remaining sugar in the same manner, one third at a time. Beat mixture thoroughly, scraping the sides as you go. Add the vanilla and one forth of the flour. Beat on low until dry ingredients are mixed in and then add 1/3 of the sour cream. Mix the sour cream in and then alternate in the same manner until all the dry ingredients and the sour cream have been added. You should end up adding flour four times and sour cream 3 times. As you are mixing, be sure to scrape the sides. Carefully spoon in two full cups of batter into the bottom of the buttered pan. Spread the batter out evenly on the bottom of the pan. Sprinkle about 1/2 cup of filling evenly over the layer of batter in the pan. Repeat these layers in the same manner. When spreading batter on top of the filling layer, be careful that you do not disturb the filling layer. You should end up with 4 layers of batter and 3 layers of filling. After the last layer of batter is spread out sprinkle the streusel on top. 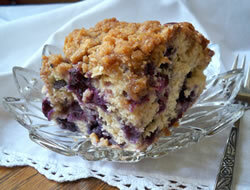 Leave the streusel coarse and crumbly. Lightly press the streusel down on the batter. Place in an oven preheated to 350Â°F. Bake for approximately 70 minutes. Check for doneness after 60 or 65 minutes. A toothpick poked in the center should come out clean. Place on a cooling rack and allow the cake to cool for one hour. After one hour, remove the cake by pulling up on the center tube and pushing carefully from the bottom. To remove the bottom and center tube cut a piece of foil big enough to cover the top of the cake. Put it over the top of the cake and poke a hole for the center tube to come through. Form the foil tightly around the top of the cake. Take a long knife and slide it all around the bottom of the cake to loosen it from the bottom of the pan. Place a large plate over the top and with one hand on the plate pull the cake to the edge of your work surface and carefully work the other hand under the cake so you are holding it between both hands. Flip the cake upside down and set the plate on the work surface and the cake should side off the tube. Place your cake plate on the bottom side of the cake, which should be facing up now and holding the cake in the same manner, flip it back over so the top is facing up and the cake is placed on the cake plate. Serve while the cake is still warm or allow it to cool if you prefer. "This cake was perfect! It was super moist, and did not dry out as the days passed. I mixed cinn and sugar in a little bowl and sprinkled it ontop of the cake before placing it in the oven ( extra sweetness). It was delicious and I will definitely make it again and again!"